Greetings and salutations, loyal readers. 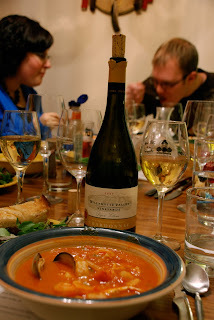 We're excited to bring you this review of The Oregon Wine Blog's Winter Pairing Dinner -- unique in that it not only chronicles the wine and food from our dinner, but also the cookbook utilized for 90% of the recipes: The Vintner's Kitchen: Celebrating the Wines of Oregon. Published in 2008, The Vintner's Kitchen is the second volume in Arnica Publishing's A Chef's Bounty Cookbook Series. Written by Bill King, the book "honors the pioneering spirit displayed by our regional wineries and vintners in their quest to produce phenomal, award-winning wines." The cookbook takes gourmet recipes covering the spectrum of culinary adventure and ingredients in Oregon and pairs them with specific wines from the state. The result is a fusion of food and wine that will leave the diner in a state of euphoric delight. From the minute I picked up The Vintner's Kitchen, I knew in it's pages contained the vision for the winter wine dinner our staff had been talking about. We entered the project with the highest of hopes - to present every course of the dinner directly from the book, matched exactly with the listed wines. We selected the menu, listed below, and approached the wineries requesting samples for the dinner. We quickly found that most of the wines or vintages listed were not available, so we took editorial discretion and made local pairing decisions based on our knowledge of the wines we used. We're grateful to the selected wineries for providing the wine for review, in typical The Oregon Wine Blog style, our plans changed drastically from start to finish and the outcome was amazing. I'll take you through each course and the respective wine, sharing the thoughts and tastes of our esteemed panel of judges: myself, Rick Goranflo, Micheal Seraphin, Drew Desilet, Alyssa Dart, and Megan Beresford. Starting off the night was a dish unlike any we had ever prepared before. In short, this dish is a tortilla with Oregon jack cheese, hazelnuts, and a pear salsa. Most notable about this dish is the fact that the hazelnuts used on the crisps were supplied by the same folks that produced the wine; Tyee. That's right, Tyee Wine Cellars also sells hazelnuts grown right next to their grapes and we were the lucky recipients of five pounds of them. It only makes sense to pair them with Tyee wine. I would say this dish had the widest array of expectations as none of us had ever had a pear-based salsa. While it didn't come out spicy, many diners agreed that its end result of being more refreshing was actually a welcome trait. Diners noted the "nice combination of hazelnuts, cheese, and salsa" as well as the hazelnut adding a welcome texture. The wine was described as "tangy," "very tart," "crisp," and hinting notes of apple. More to the point, the pairing was perfect. While the salsa didn't come out spicy as anticipated, the wine would have worked just as well with some added heat. Tyee is a great winery and their gris is a nice catch. Let me first preface that we did not pair both dishes for all diners. While many of us believe creatures pulled from the bottom of the ocean to be some of the most delicious critters on the planet, two of our guests did not. Instead of making them suffer through something we already knew they wouldn't enjoy, we created an alternative dish lacking any seafood; corn and cheese chowder. I'll also preface that like most multi-course dinners, everybody expected this course to be good, but not the crowning achievement of the night. It's a soup and salad dish, right? Right, but both completely different soups were largely considered the most delicious courses of the night matched with one of the best wine pairings. Regarding the shellfish stew, all but one of us immediately noted a strong hue of orange brought on by it's fresh orange zest. Also surprising was a bit of unexpected spiciness, which one noted somewhat challenged the wine. We all agreed that the stew itself was absolutely delicious and a dish that will have to be made again. The chowder produced just as much praise, albeit a completely different dish. While a simpler dish, the combination of melted cheese, large pieces of cracked pepper, and Yukon gold potatoes perhaps made the most perfect pairing of the night. For more about the wine, check out our previous review of Willamette Valley Vineyard's 2007 Dijon Clone Chardonnay. Willamette Valley Vineyards is always a solid choice. While not necessarily cheating, I will preface that Josh and I had made the cornish hens before. Why did we decide to use them for an event such as one of our regionally-famous wine dinners? Because they're damn good. This sentiment was shared by all as the spice rub was delcared the perfect amount of spice for everybody while also not overpowering the wine. This course was declared a great main course, but in all honestly, many of us were still reveling from how awesome the last course was. I also way over did the broccoli due to a timing issue with the hens. Oh well! 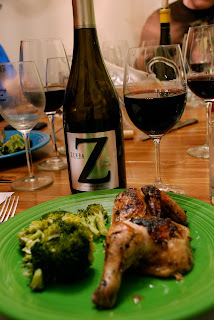 People did have a lot to say about Zerba's 2006 Columbia Valley Syrah, however. Michael was the first to note that it wasn't as heavy as some syrahs, but spicy enough to remind you it is from Eastern Washington. Other popular hues brought out by this wine are those of tobacco, currant, and a little bit of smoke. Alyssa specifically noted cherries or plum. All in all a fantastic syrah that many agreed would hold up on its own. We wanted to hit Zerba last time we were in the Walla Walla Valley, and now will definitely have make it. I'm going to put out there that neither of us are bakers. We can cook some mean food, but are often at a loss when baking and having to troubleshoot. Luckily, Alyssa is quite comfortable baking and was a huge help in making this dish a success. What was at one point thought to be a potentially disasterous dish ended up being exactly the opposite. In fact, half of our guests considered this their favorite course. This dish is a crust of mostly butter and flour stacked with slices of pear drizzled in a dessert wine reduction and creme fraiche. Like all of the above? So did we. Many people noted that their favorite part happened to be the crust, while others also mentioned that the creme fraiche actually mellowed out the sweetness. I would also like to take a minute to recognize the wine donated by our new friends at Harris Bridge Vineyard. This small winery only produces dessert wines and their offerings are becoming available at more and more shops around Corvallis. The other cool part about their wine is that the winemakers live about three blocks away from us and gave us among their first review bottles. Also noteworthy about Harris Bridge is that pretty much the entire operation is done by hand. The first thing you'll notice with every bottle is a short story tied around the top. Every story is written by Sarah herself, which is numbered on the top so you can select wines according to the story attached. We received stories 1 and 3, which means we have a few more to collect. With full time vocations outside of wine, Nathan and Amanda are able to run their winery the way they want to -- with attention on small lot production not profit. The wine, Sarah's Story, was the only wine universally enjoyed by all guests. 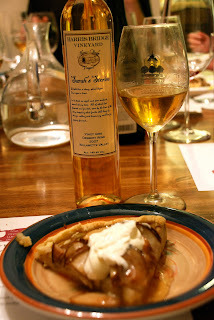 A dessert Pinot Gris, it brings forth an essence of apple and some peach but is unlike most dessert wines you will taste. With a nice lightness but plenty of sweet, I guarantee you'll love this one whether you like dessert wine or not. Are you salivating yet? You should be! As you can tell, all of these dishes were absolutely delicious, and we'd suggest picking up a copy of The Vintner's Kitchen available for $29.95. A quick word of warning, some of the recipes are a bit vague so we relied on our confidence as chefs to produce the results. If you need everything exactly prescribed and timed in the kitchen, you may need some trial and error before being successful. Please support the wineries that contributed to our dinner as they all make great wine, are good people, and support the local economy. We're already working on concepts for our Spring Wine Dinner. Some ideas we're looking at include a Sake tasting, or, a "farm to mouth" in 100 miles dinner. What ideas do you have for a wine pairing dinner? Hi Josh- I just discovered your blog... I like it a lot. I'll be a regular reader for sure. One suggestion- your photos all have the color balance way too warm (yellow orange). It would be a big plus if you shifted them more towards daylight balance. YOu might be able to manipulate your lighting by changing the white balance on your camera. Works somtimes. 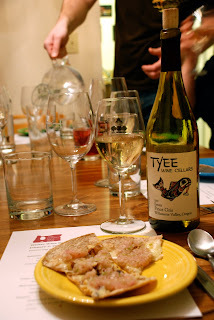 Thanks for sharing the 2007 Tyee Estate Pinot Gris review. I like the wine from France,their varieties, history and regions; Bordeaux, Champagne, Alsace and more.